This is a mighty adventurous release from head of the now defunct Looney Tunes. It's nothing like them, and not like much else either. The basis is surf and go-go and bachelor pad and lounge and tiki and exotica, all poured liberally into a blender and homogenized for an hour or two, then reconstituted and inverted. More about rhythms and hypnotic beats than melody, yet infectious and intriguing. This is a thickly arranged go-go number. Minus a melody, a relentless progression supports a swirling array of organ and guitars in a noodle fest. Nearly hypnotic, it seems to mumble and grumble in grodie way. Exotic percussion and grodie sounds mixed with guitar and distant melody lines creates an air of dissonant disorder and impending chaos from across the city. Quite unusual and pretty interesting. Well, isn't this an interesting track. In some ways, it's an MOR extravaganza, and in others, an exotic ritual with flute. melodically interesting, tribally impulsive, and curiously feverish. Based on a tweaky riff with exotic percussion and sporting damped and relatively dry surf chops, this is hypnotically rhythmic and oddly cool. No melody, but then it doesn't seem to need one. Even traces of reggae are found as every corner is populated with percussive bits. Floating almost samba percussion and a melody played in duet between surf guitar and organ. Very suave and oozing faraway places relaxation. Light as a summer shower, floating on a fluffy white cloud, drifting like a tropical breeze... a very pretty melody in a near-hokey setting. I should hate this, but I don't. Quite tasty in a delicate way. Cross Deliverance with Sitar and Bedouin adventure, and you get a fascinating journey down the Nile. Surf guitar, lounge and exotica, and thundering tribal tom toms. Rhythmic and just too fun. Really nice guitar work, sideshow organ, playful melody, and a sorta Jack Marshall theme. MOR with edge. This haunting tune floats on a sea draped with kelp on a sunny afternoon. Surf's flat, so just drift on the gently rolling swells and gaze into the horizon. Stunningly nice track. Departing from the airport, propped up by kettle drum drama, this thickly bassed tune is like a calliope in heat at a Lawrence Welk summer camp for wayward musicians. Strangely attractive, yet cheesy like a bachelor pad gone awry. Images of the old Command Classics covers with boudoir scenes of geeks with boxers and black socks still on come to mind here. Rhythmically like Joey Dee's "Mashed Potatoes" and electro tweaky like Yellow at the beach. The odd mix of surf guitar and sequences seems both repulsive and inviting - you know what I mean... The kind of thing you love to hate because you secretly love it. 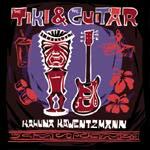 Lovely surf guitar, island percussion, tweaky sounds, rhythmic pulsation, and sparkling coolness. A fine track with an ample helping of friendliness. Gets right under your skin and stays there. Really cool!